It takes three weeks to build a habit. We’ve all heard the adage and, in my experience, it does stand true in many instances. But getting through those three weeks can be tough and not everyone has the same self-motivational threshold. That’s what the new iPhone app Lift is all about. The app comes from developers Tony Stubblebine of Crowdvine, Jon Crosby of Path, Matt Matteson and Mark Hendrickson of Plancast, in partnership with Obvious Co., a project of Twitter co-founders Biz Stone, Evan Williams and Jason Goldman. 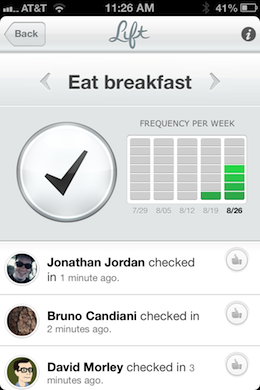 The app allows you to choose personal goals that you would like to massage into habits. It then encourages you to check off each one that you partake in daily, tracking your progress and rewarding your continued pursuit of the goals with streaks, beautifully displayed graphs and interaction with friends on similar paths. I’ve been testing the app for a few weeks now, and I find it engaging and pleasurable to use. 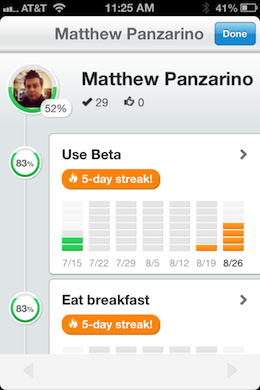 You can add custom habits or choose from a list of them created by others. 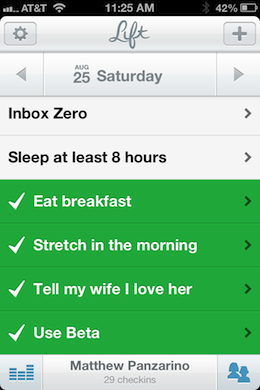 I added a few simple ones like a morning stretch, trying out the beta app each day and telling my wife I love her. There’s no doubt that there are many ways to use the app, but basic human behaviors that we’ve always wished we made more frequent is what I see as the core benefit here. Lift also works to reinforce habits that may flare, then fade, like flossing or getting a bit of cardio. We all get enthusiastic about things like health or hygiene, but that surge of initial adherence often gets swallowed in the minutiae of daily life. I’m going to be completely honest with you here, I’m really not sure if Lift worked during my time testing it. But I was also not as thorough about using it as I could have been…which is really the problem, right? If you’re not motivated to do these things in the first place, how are you going to stay motivated to use the app? That’s where Lift’s social features come in. If you get a few friends or coworkers using the app, they can encourage you when you accomplish a goal and share notes about how they’re doing and what methods they’re using to help them maintain habits. Think of it as a social to-do list that combines the rewards of filling an activity graph with the motivation of Nike’s ‘cheering’ feature in its running apps that lets people egg you on while you jog. What I can tell you about the app is that it’s designed very well, with crisp, bright elements and zippy performance. The amount of friction is very low for confirming an action, which is important for those of us that need help with motivation. I do wish that you could check in to an activity right from the main list, as it takes two taps right now for something that could be accomplished with one. It feels like heading to the detail view to see your progress should be an optional action, not a default. I talked to Lift’s Tony Stubblebine about that detail. “It’s not about checking off options with your eyes closed,” he says. Instead, it was very much a choice based on creating a “feedback loop” that rewards users for their progress. He points out that the core user-base of Lift is already likely to be doing some form of habit tracking, and that the app will help to lower the barrier for them. But there is also a large group of people who have a difficult time accomplishing this kind of tracking, and that’s where the social aspects of Lift come in. “People having access to a positive bit of support” is what Stubblebine says is the unique aspect that sets Lift apart from a simple ‘to-do’ app. 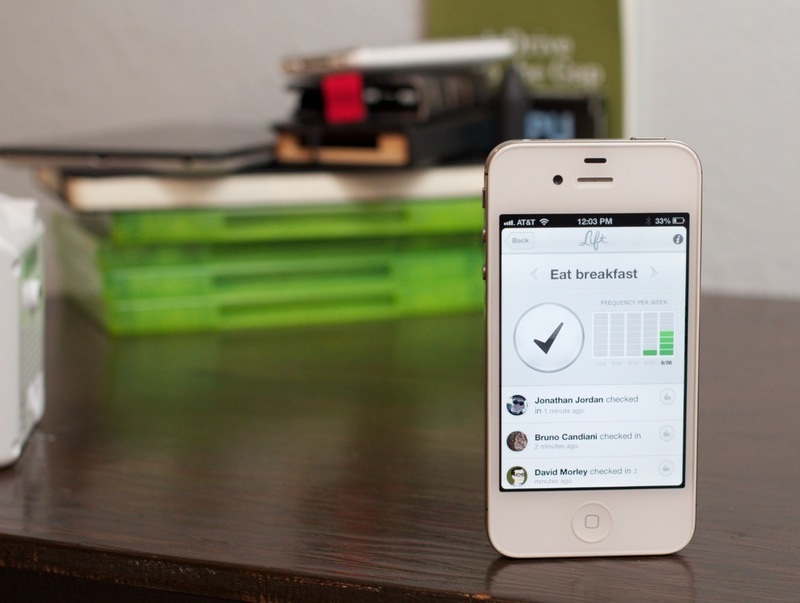 Lift was built using deep research into the psychology surrounding the formation of habits. This is not a casually approached endeavor. “This is what we want to be doing for decades,” says Stubblebine. He points out that a lot of these motivational apps start with negativity, “I’m fat”, rather than positive forward-looking ideas about what people need to do about it. And it’s working, he says. 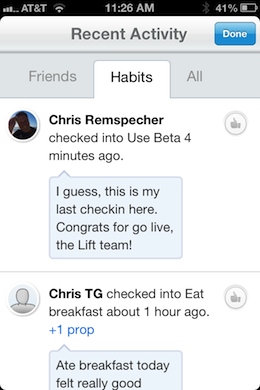 Lift has seen incredible engagement during the beta test and is getting great feedback from users so far. You can check out Lift on the App Store now for free. Find the latest apps right now at TNW Apps.